One of our most popular products, Mind Shapes uses textures, sound, colours and high-contrast graphics to keep your baby interested. 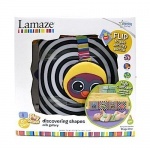 Suitable from birth to two years, the 3 Mind Shapes consist of a pyramid, a cube and a sphere. They are soft and light, making them easy for babies to manipulate and shake around, throw, crawl after and generally explore.